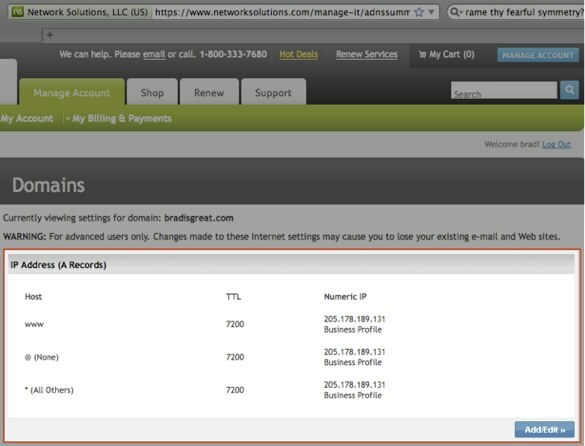 After you have reviewed theÂ processÂ for pointing your custom domain name to your Ning Network, follow these steps to set up the proper domain mapping withÂ Network SolutionsÂ as your registrar. If you have any questions specific to Network Solutions, please visit theirÂ Support Center. 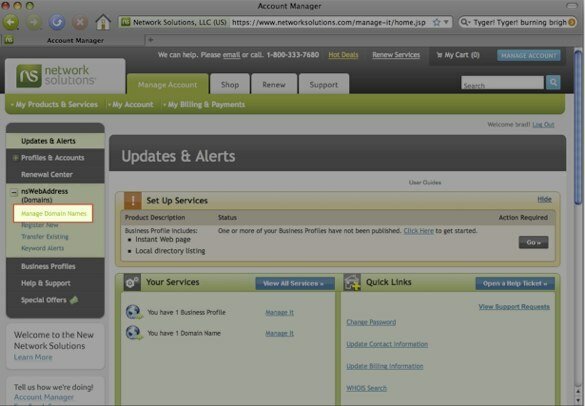 After signing in to Network Solutions you should be taken to the Manage Account page.Â If you’re already signed in or are not taken to this page, click the Manage Account button at the top right. 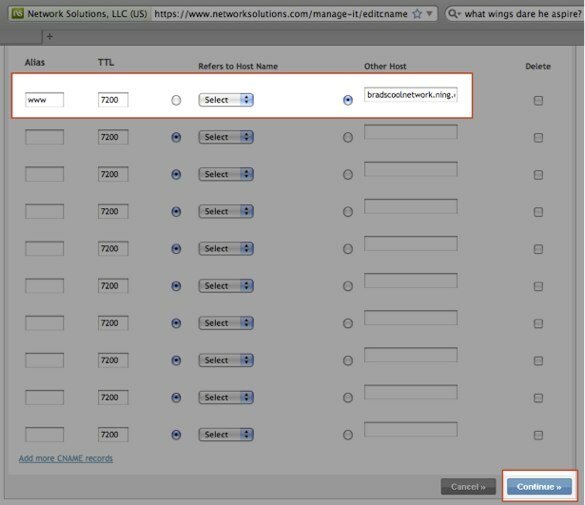 On the Manage Account page click on â€œnsWebAddress (Domains)â€ on the left side of the page and then click the “Manage Domain Names” link. Â Â Â Â 3. 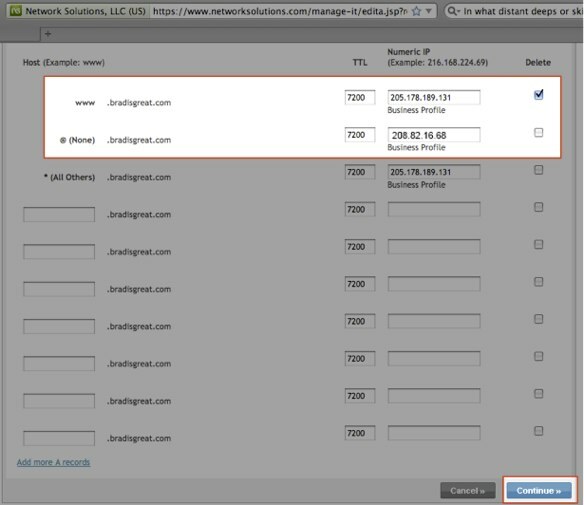 Â Under the Domains section you should see domain details for each of the domains you have registered with Network Solutions. Locate the domain you’d like toÂ haveÂ point to your Ning Network.Â You should see a “Domain currently points to:” field, with an Edit link to the right. If you see this Edit link, click on it and skip downÂ to step #5.If you don’t see an Edit link here it most likely indicates that you have just purchased your domain or have not made any previous changes to your DNS settings. Instead, look below the “Domain currently points to:” field and you should see a “Change domain to point to:” field. To the right, select the Designated DNS radio button and click the Apply Changes button. Â Â Â Â 4. 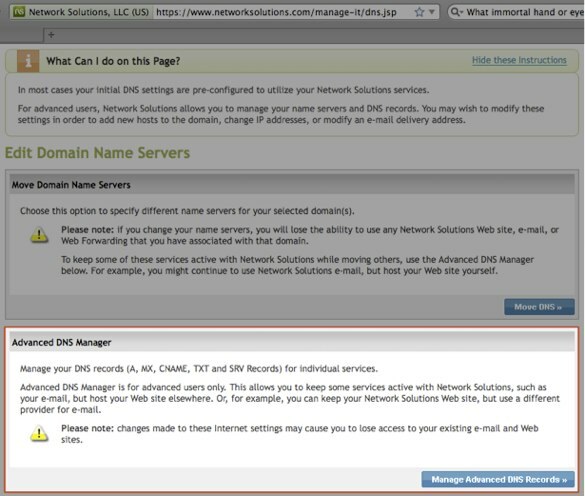 Â Locate the Advanced DNS Manager box and click the Manage Advanced DNS Records button. Â Â Â Â 5. 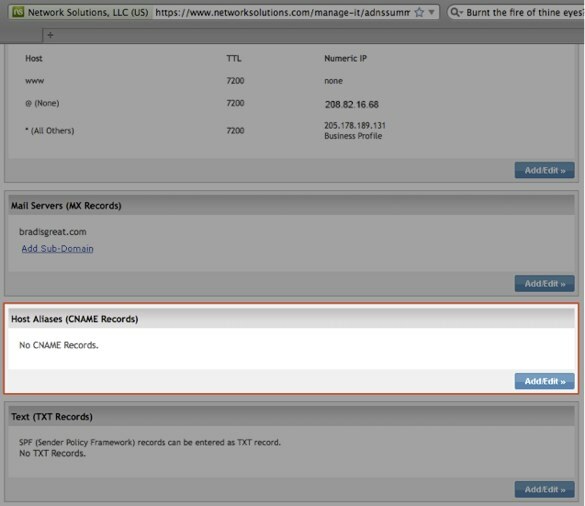 Â On the Domains page, in the “IP Address (A Records)” section, click the Add/Edit button. Â Â Â Â 6. Â For the first entry, which has “www” under the Host column, click the check box under Delete. Then, for the second, “@ (None)” entry, enter Ning’s IP address, 208.82.16.68, in the Numeric IP field and click the Continue button. Â Â Â Â 7. Â You’ll be taken to a confirmation page where you’ll need to click the Save Changes button. Â Â Â Â 8. Â You should then be taken back to the previous Domains page. Scroll down to the “Host Aliases (CNAME Records)” section and click the Add/Edit button. Â Â Â Â 9. Â In the top entry, in the Alias field, enter “www”. In the Other Host field enter the Ning sub-domain of your network, without the “http://” (for example “bradscoolnetwork.ning.com”). Make sure you’ve selected the radio button next to the Other Host field and then click the Continue button. Â Â Â Â 10. Â You’ll again need to confirm your changes by clicking the Save Changes button. 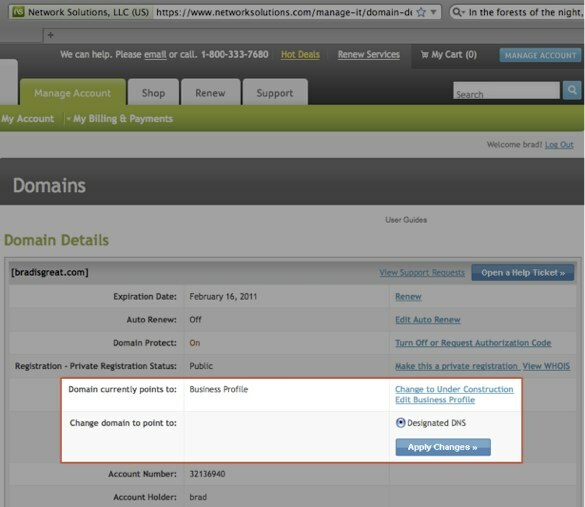 Finally, head backÂ toÂ your My Network page andÂ click “Domain Mapping.” Here you’ll be able to choose the domain (domain.com, for example)Â you’d like to redirect to. Be sure to select the button next to the domain name you want to appear as the URL for your network. Click the “Save” button, and you are ready to go!